At only 30-years-old, Fields Medal winner, Peter Scholze, is already considered one of the world’s most influential mathematicians by the scientific community. He is, however, a very down to earth guy. With his long hair and dazzling ability to see patterns and connections, he has been called the ‘Mozart of Mathematics’ and some of his contemporaries admit to being intimidated in his presence. He was the red hot favorite to pick up the medal this year and his win comes as no surprise to anyone working in the field. At 24 he became a full professor at Bonn University in Germany after completing his undergraduate course and masters degree in only 5 semesters. He announced himself as a modern giant in 2010 when he simplified a complex mathematical proof of numbers theory from 288 to 37 pages. 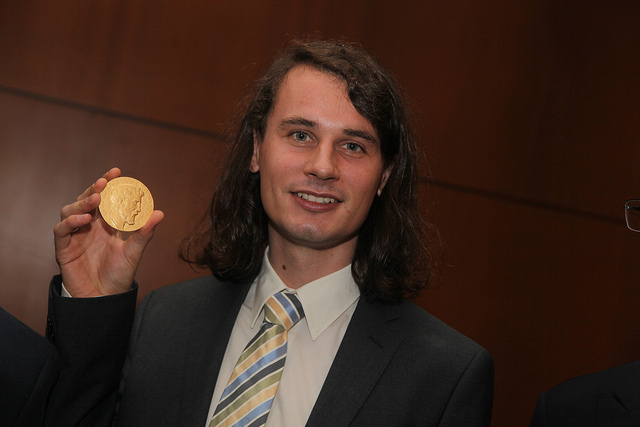 A specialist in arithmetic algebraic geometry, Scholze collects top math prizes for fun. He is a former recipient of the EMS, Leibniz, Fermat, Ostrowski, Cole, Clay Research, SASTRA Ramanujan, Prix and Cours Peccot. Now he puts the cherry on the cake with the Fields Medal. His work focuses on building a bridge between arithmetic and geometry. Despite already achieving so much, his potential is absolutely huge and Scholze shows no signs of slowing down at all. “As soon as you solve one problem there are 10 more coming,” he explained.